This post has been updated with additional information on the intellgence findings that informed U.S. leaders’ decision to carry out the attack on Thursday. THE PENTAGON — Senior U.S. defense officials today briefed reporters on the planning and execution of a Tomahawk strike on al-Shayrat Airfield in Western Syria Thursday night, which involved two guided-missile destroyers launching 59 missiles at targets. The U.S. strike comes after an April 4 chemical weapons attack on the town of Khan Sheikhoun, where several dozen civilians, including many children and women, were killed by what appears to be sarin gas. The following is a timeline of the April 4 attack and the decision process of U.S. leaders leading up to Thursday’s strike. 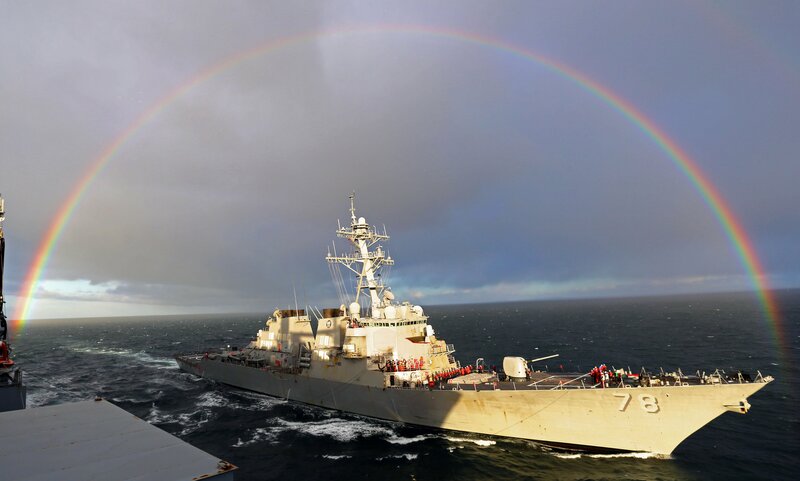 The official said that all the options presented to President Donald Trump were also sent to U.S. Central Command, and to destroyers USS Porter (DDG-78) and USS Ross (DDG-71), to begin preparing for any potential decision. 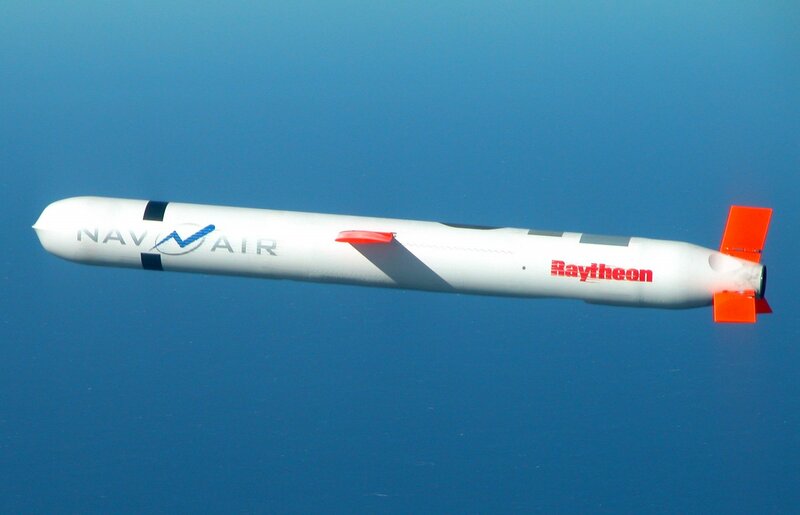 On April 6, Trump selected the Tomahawk Land Attack Missile strike option, which military officials have described as both “proportional” but also “our lowest-risk option to conduct the attack” due to the standoff range they allow. Russian military forces operating in Syria have sophisticated integrated air defense systems, and officials did not want to send manned fighters into harms way – though the Russians ultimately did not attempt to intercept any of the TLAMs coming towards the Syrian airfield. 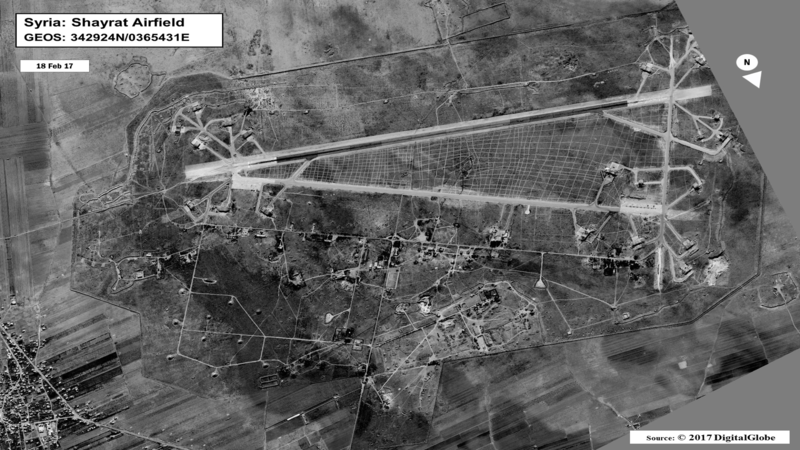 An image of the Sharyat Airfield in Syria. Image courtesy of the Defense Department. 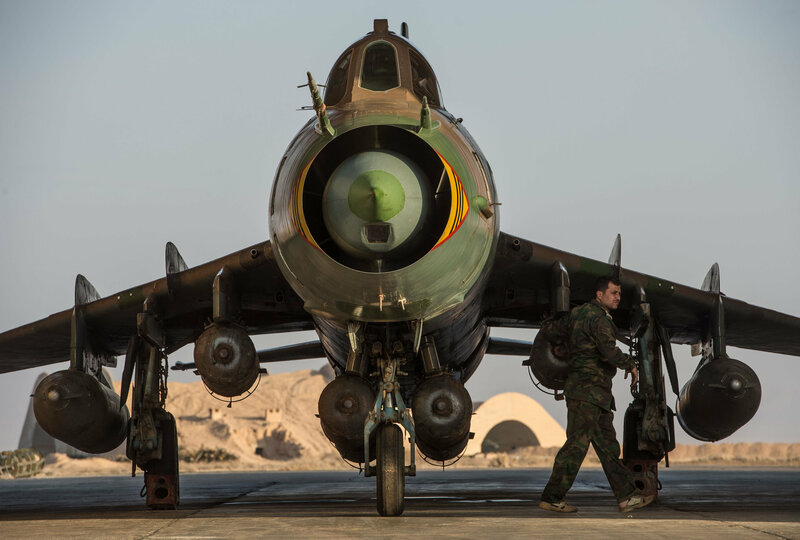 Targets included various aspects of Syrian regime capabilities – but they steered clear of known Russian assets, including rotary wing aircraft, facilities for between 20 and 100 Russian military personnel and more. 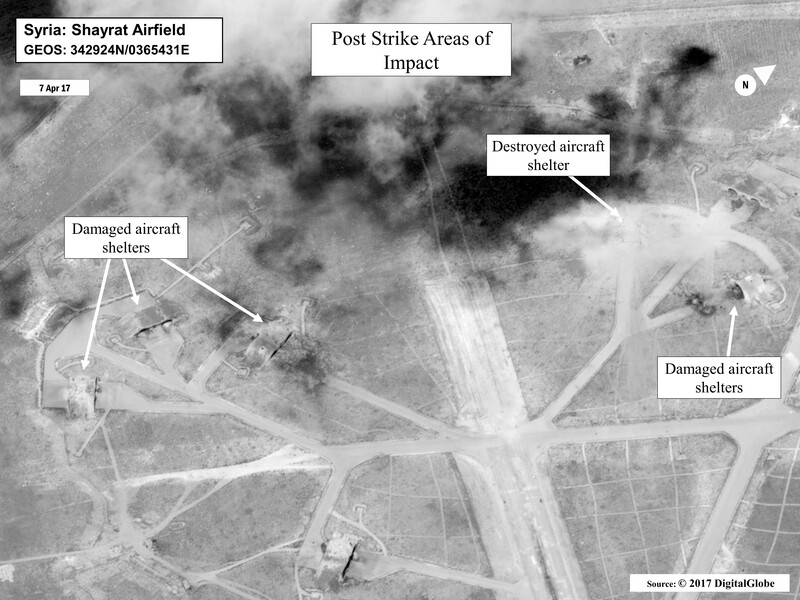 The defense official said that initial damage assessments show that all 59 targets were hit, though it is impossible at this point to verify that all the planes that had been inside the hardened aircraft shelters were still there at the time of the attack and were destroyed. Officials are calling the damage “about 20 aircraft,” all of them Russian-made and Syrian-operated fixed-wing aircraft – including those that were involved in the April 4 chemical attack. The runway itself was not targeted – the TLAM, based on its size and capability, would have had little impact on the runway and would be “a waste” for that target set, a senior defense official said. 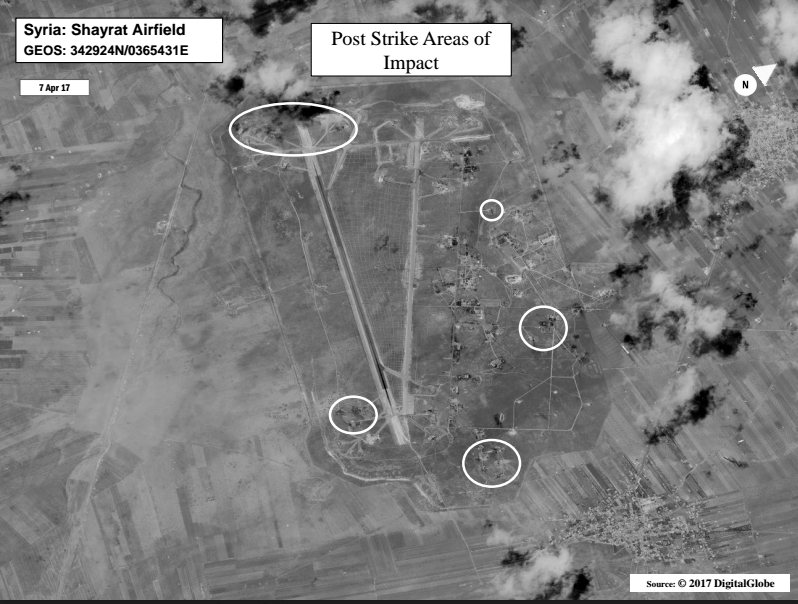 The timing of the attack – around 3 a.m. local time, was chosen to avoid any potential civilian casualties, though the official said there are no towns or homes near the airfield. The official added that there was no indication of civilian or military casualties at this point. Earlier this month, the head of U.S. Strategic Command spoke in praise of the U.S. Navy’s surface fleet as his preferred method of conventional strike in a crisis.Air Force Gen. John Hyten said strikes from surface ships – versus submarines or bombers – offer an unambiguous message when the U.S. chooses to use force in a conflict.“The surface Navy provides options,” unavailable from other platforms,” he said speaking at the Military Reporters and Editors conference in Washington, D.C.
“We can put those ships where we want them.”Thursday’s strike from USS Ross (DDG-71) and USS Porter (DDG-78) was the largest TLAM employment since 2011’s Operation Odyssey Dawn from ships that are primarily tasked with ballistic missile defense missions. While BMD is their primary role, the ships were able to quickly prep for the strike using the same vertical launch cells — 90 on each ship — that hold anti-air missiles and BMD interceptors to launch TLAMs. “These platforms provide an option for the leadership for a measured and deliberate strike. That’s their value,” Capt. 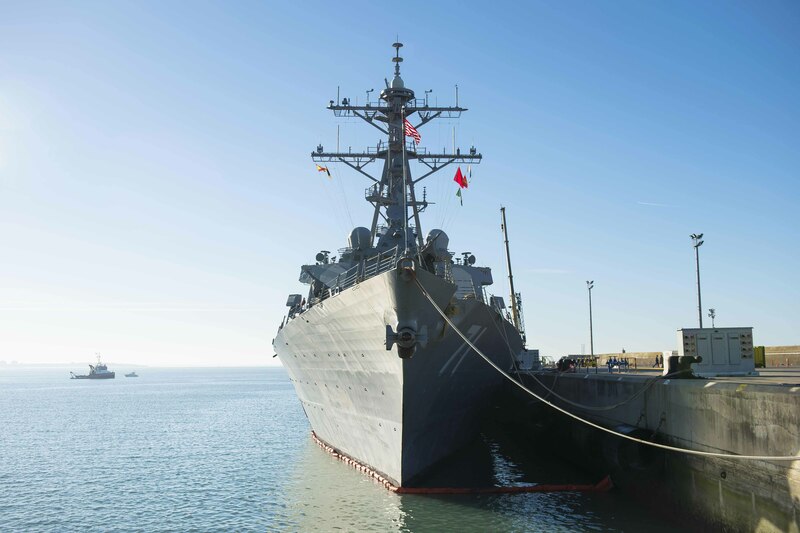 Paul Stader – former commander of USS Hue City (CG-66) and USS Ross (DDG-71) — told USNI News on Friday. A second senior defense official explained to reporters the background of the air strikes, as the U.S. has watched the Syrian regime escalate its chemical-related attacks on its own civilians in recent weeks as opposition forces threatened to take an important military airfield in Homa. On March 25, the Syrian regime dropped chlorine industrial chemicals on Homa. On March 30, the regime dropped an unconfirmed chemical on Homa, which a non-governmental organization on the ground said was consistent with a nerve agent. 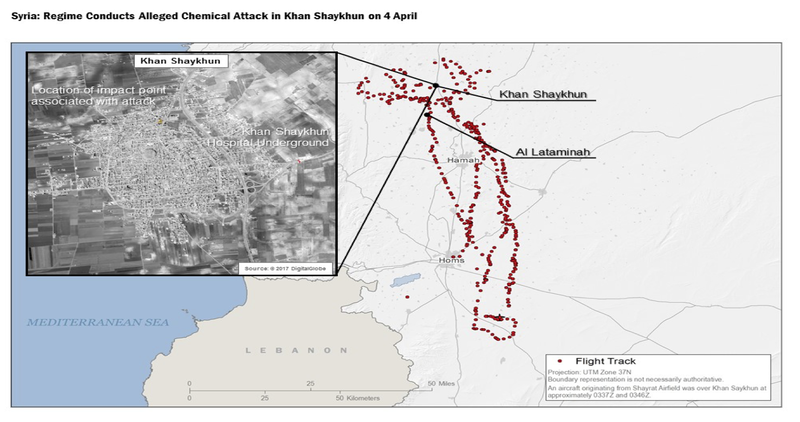 On April 1, the regime dropped a sarin bomb on Khan Sheikhoun, in the in Idlib province, in the worst chemical weapon attack since 2013. The U.S. military has tracks of Syrian aircraft flying from al-Shayrat Airfield to Khan Sheikhoun and being in the area just before 7 a.m. that morning, around the same time that reports of sarin-related casualties started coming in. “We know the routes that the aircraft took, we know these aircraft were overhead at the time of the attack. The time of the attack was early morning, we suspect it was about 0650, 0655 or so. And reports of nerve agent-exposed casualties began almost immediately, at about 0700 we started to see the first reflections of a potential use of nerve agent,” the official said, adding it would “probably have been an SU-22” that dropped the chemical bomb – a Russian-built plane that the Syrian regime flies. Shortly after the chemical attack, “as civilians began to flow into the hospital there in Khan Sheikhoun, a UAV (unmanned aerial vehicle) was seen over the target – a small UAV, either regime or Russian, flying over the hospital during the evacuation of the patients. There was lots of ambulance activity, and clearly people moving into a hospital. Some hours later, about five hours later, the UAV returned, and the hospital was struck with additional munitions (from a fixed-wing aircraft). We don’t know why, who struck that, we don’t have positive accountability yet, but the fact that somebody would strike the hospital, potentially to hide the evidence of a chemical attack … is a question that we’re very interested in,” the official said, noting that the plane that bombed the hospital was Russian built but it is unclear at this time if it was operated by the Russian or Syrian military, both of which use similar Russian fighters. The U.S. also has not identified who owned the UAV that collected intelligence for the hospital strike. 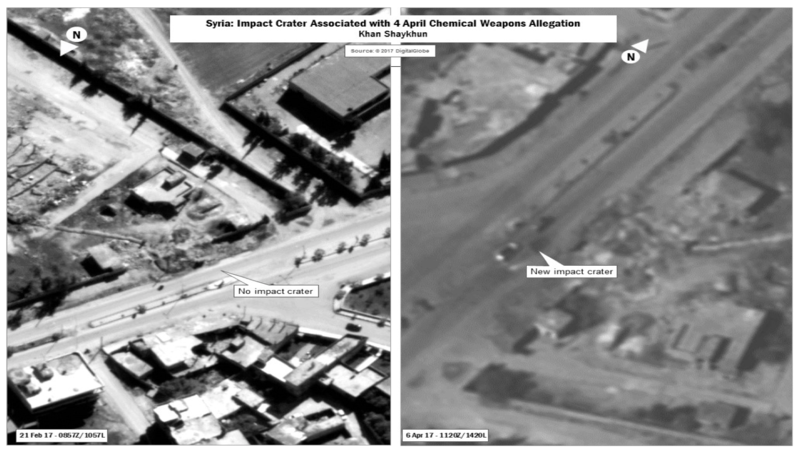 Beyond any potential ties to, knowledge of or support for the April 4 attack, the Russians in 2013 had offered themselves as the guarantor that Syria would turn over all its chemical weapons for destruction. 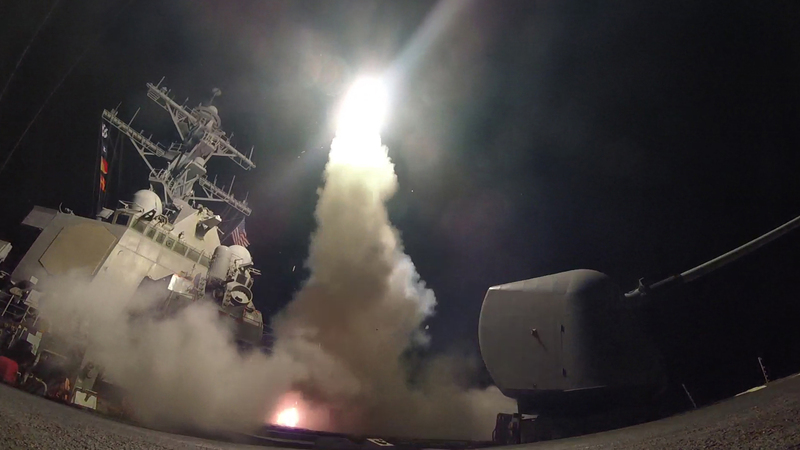 The official said the U.S. had taken Russia at its word at the time that all chemical weapons had been removed, but in the aftermath of this attack U.S. intelligence will be paying close attention to sites previously used for chemical weapons attacks to look for further signs of current chemical weapons capabilities in Syria.